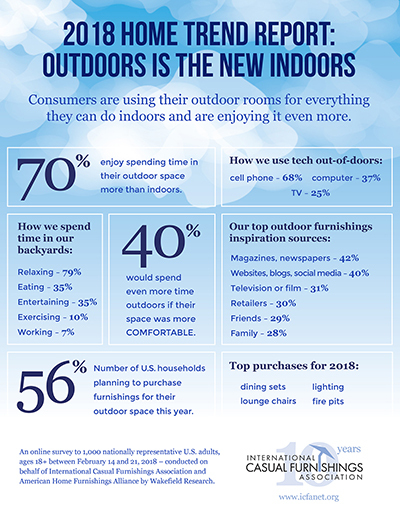 According to research from the International Casual Furnishings Association, many people use outdoor rooms for things they can do indoors – from using cell phones for calls and games to working on computers, watching TV, eating, exercising and, of course, relaxing. 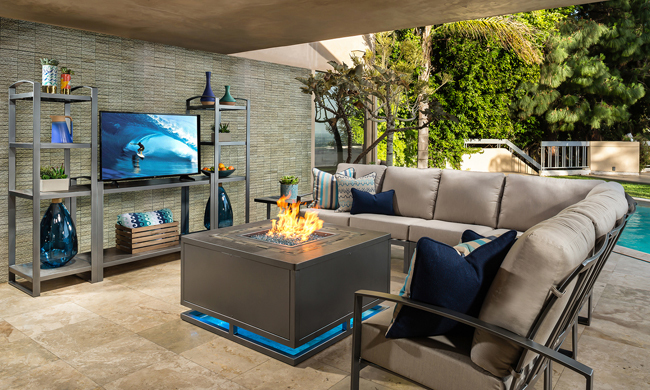 Dining tables and chairs top many people’s outdoor shopping lists this year, followed by lounge chairs, lighting, fire pits, umbrellas, and sofas. Leading the list of trends in the dynamic dining category is ultra-comfortable seating and a wide variety of table options. The research also shows 68 percent of people use outdoor spaces several times a week in seasonally appropriate weather. Comfort, spaciousness, and style were the most important factors in encouraging people to spend more time outdoors, which is why deep-seated chairs with high backs for relaxed comfort rank high on wish lists. Much like spaces indoors, outdoor rooms are leaning more toward mixing rather than matching, both in individual pieces and in groups of pieces. To help meet this trend, try looking for pieces that incorporate several different elements such as aluminum, wicker, and teak, as well as groups that pair, for example, wicker seating with iron or wood tables.